The Little Tikes Police Cozy Coupe Car is a fun twist on a classic ride on. For 30 years, the child-powered Cozy Coupe ride on has been loved by kids and parents alike. 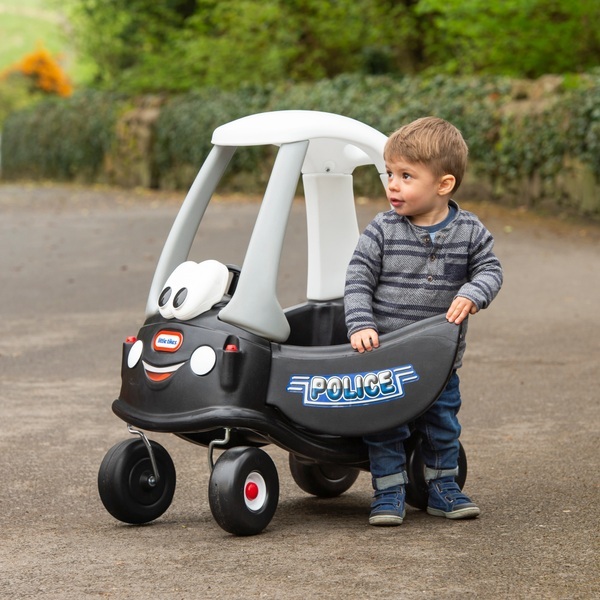 The adventurous police-car theme creates a whole new world of imaginative play. Toddlers love being behind the wheel of a car with easy manoeuvrability that lets them be in control, while parents love the durability and charm of the Little Tikes Police Cozy Coupe Car. This ride on combines classic design with new innovations. The rear storage now features cup holder moulding. The driver’s door has a smoother design and opens and closes. The back of this high-seated ride on is equipped with a parent grab handle perfect for the Little Tikes Police Cozy Coupe Car’s push mode: simply insert the removable floorboard to protect your little one’s feet when they aren’t powering the car themselves. It can easily be removed again for kids to use foot-to-floor power. The front swivel wheels spin 360 degrees, so this car is eas for kids to control. The foot-to-floor mode is great for developing gross motor skills. With the friendly face on the front, the clicking ignition switch, the working horn and the petrol cap that opens and closes, the Little Tikes Police Cozy Coupe encourages active play and imaginative fun. Take cops and robbers adventures on the road with one of the original ride on toys.